Beware Of Farm Raised Foods! This is something that has gained a lot of steam lately and I definitely don’t think that people are aware of the inherent side effects of eating farm raised foods. For instance, when you go to your neighborhood grocery store and for me since I’m in Orlando that is hands down Publix (best deli subs on the planet) then go check out the seafood counter. You’ll notice when you belly up to the glass that you’ll see something like Medium Size Shrimp. Underneath that you will see a fraction like 21/25 and beneath that they should have whether it is farmed or wild and the location of where. First let me explain what to look for here and what the fraction means. Everything in the seafood section including fish is weighed and priced by pounds. 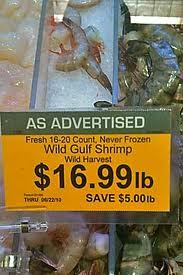 So for the fraction they are telling you between 21 to 25 shrimps will equal one pound. It helps you portion out your meals but people ask me that all the time. Secondly, always look for “wild” instead of farmed and this includes the fish, shrimp, scallops, crab, lobster, shellfish etc. But is there a huge difference in eating this? Well overtime yes. As you know by now I am an avid person behind eating fresh organic foods and the reason is because they are all natural. The side effects of farm raised can cause risks in cancer! This is a major problem and the reason is because of the lack in nutrition. Foods grow organically because they know what nutrients and vitamins they needs to grow properly and more healthy. When we decide to intervene we tend to confuse things. That sounds too scientific, or existential like but here’s what I mean. Let’s take for instance fish. 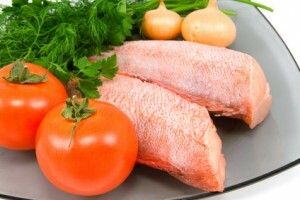 Fish are free to get lots of exercise in the open ocean or fresh waters with plenty of room which build up muscles and natural oils like Omega-3 and Omega-6 oils which are great for your heart and brain functionality. When we put them in a farm raised environment what is happening is that they tend to get crammed and rub against one another and this dense population in a small space can cause illnesses. Additionally, the actual natural behaviors of the fish are inhibited. Also you need to look at what the fish are eating. They say, “You are what you eat!” and the same is true for animals. If they eat healthy then when we eat them they taste healthy. Sorry vegetarians for that thought. This is a few major reasons why any food you should have should not be farmed, it should not be processed, and it should lead you to a longer and healthier life in doing so. The same is true when we recommend our whey protein powder, which is another great supplement and superfood that helps fight off cancer, aids weight loss, tones your body, lowers cholesterol, lowers blood pressure, prevents Alzheimer’s Disease and tons more. Go here to learn more about what whey protein powder I personally take and which I would recommend to you my friends. Hope you enjoyed the post. Leave some love!